Tarpon migrate annually to South Carolina waters. Their much anticipated arrival typically starts in late May and many of these tarpon will stay until the water begins to drop below 70 degrees, which often doesn’t occur until the middle part of October. 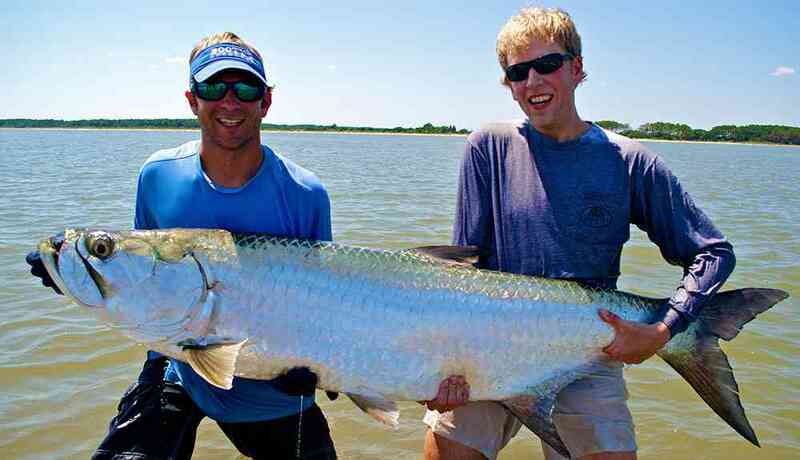 The best months for tarpon fishing in South Carolina are August and September during the annual Mullet run. This event triggers a large scale feeding frenzy as large tarpon and many other predator fish take advantage of the available groceries(mullet and menhaden). On average, the larger tarpon are caught in South Carolina later in the season, and fish in excess of 130 lbs are common. Fishing tactics for South Carolina tarpon vary from live bait, to artificial lures and fly fishing. Live baiting a medium sized mullet, menhaden, or other small fish is one of the most productive methods for catching tarpon. We will often drift live baits into a pod of feeding tarpon, or cast plugs and baitfish imitation flies. Tarpon are mostly fish-eating predators and consume mid-water prey. Prey species include: striped mullet, silversides, salt water catfishes, pinfish, menhaden, and ribbonfish. May also consume blue crab and shrimp. Heavy tackle, strong drags and stout rods are required to land a fish quickly so they can be released healthy. The annual Lowcountry Tarpon Tournament is held in Georgetown, SC and is a great event for local and visiting anglers alike. This South Carolina Tarpon Fishing Tournament is dedicated to raising conservation awareness in the state of South Carolina. A portion of the tournament proceeds help fund local tarpon research that will help us better understand this majestic gamefish. Other proceeds will help benefit Tara Hall in Georgetown County South Carolina. The Lowcountry tarpon tournament also works with scientists from the Bonefish and Tarpon Trust and their Satellite Tagging Program, which has successfully tagged 8 South Carolina tarpon(first SAT Tagged fish in SC). Please contact us to find out how you can participate in the Lowcountry Tarpon Tournament.